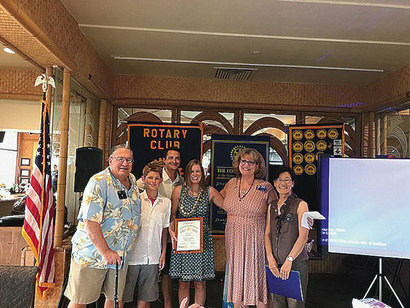 Nicole Angove was inducted into the Rotary Club of Lahaina Sunset on September 19th. Nicole is a wife, mother, business owner and active member serving the community on the west side of Maui. She and her husband are expecting a new baby to join their family in February. She is also working on building their family business West Maui Chiropractic Clinic in Honokoai with her husband Dr. Bryan Angove, also a fellow Rotarian. Nicole has been an active guest with Lahaina Rotary Sunset since she arrived on Maui in May. She and her husband chair and co-chair a new Rotary project this year supplying first aide and hygiene supplies to the homeless in Lahaina. She has also volunteered at the Go Green recycling project and Salvation Army lunch for the homeless. She loves the Lord, her family and the community. She is very excited and blessed to be involved with the Lahaina Sunset Rotary. Nicole feels like she is at home and with family while she is with fellow Rotarians. She is ready to be a part of, serve and make a difference locally and abroad with this wonderful group of people. Nicole’s sponsor is Larry Laird.